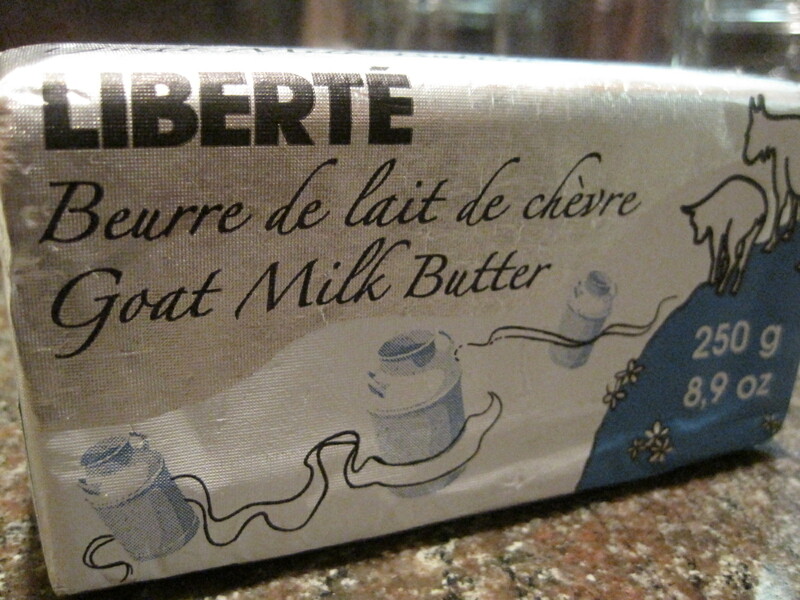 For the past two days, I've been thinking about one thing, and one thing only: goat's milk butter. I kid you not (get it? Kid? Ha food puns!). In the middle of last night, I woke up with visions of goat's milk butter racing through my mind, and an overwhelming urge to go upstairs at 4 am, break out a cube, and dig in. And even after telling myself over and over "Kelsey, go back to sleep. Stop thinking about butter," the idea of spreading some over just warmed La Brea bread wouldn't get out of my head. That's not even true. I wasn't even thinking about spreading it on bread. I just wanted to eat it by itself...what's become of me? My obsession began this year, the last week of May to be exact. This was when I was first introduced to goat's milk butter at Eleven Madison Park in New York City, and my life was forever changed. It was far less creamy and rich than cows milk, distinctly salty - almost more refreshing, but still just as bad for you. After one bite, my mission was clear: I had to make that butter mine. I was told I could find it at Whole Foods, but of course, the ones that I visited didn't carry any and the employees didn't know what the hell I was talking about. My dreams crushed, I fell into a deep pit of misery and despair, but a tiny shred of hope kept me asking friends and strangers if they knew where it could be purchased. Then, one magical Sunday evening, the answer came from one of my favorite people in the restaurant industry. Avedano's market in Bernal Heights. That's where I needed to go. Sure enough, there it was, in all its goaty wonder. It might've cost $9/lb, but I didn't care, I could finally take it home, where it belonged, and always have it close. Suffice to say that first bite was as good as I had remembered, possibly better, and I've consumed entirely too much butter, on its own, than any human should ever admit. So why don't we see it more often? Why did I have to be directed to a tiny, neighborhood market and buy a brand that's owned by a French company most commonly known for their yogurt (Liberte)? Their website doesn't even advertise the butter! Is it because only a small faction of greedy foodies are trying to keep it all to themselves? No, obviously not. I ran into Daniel Patterson (of Coi, Il Cane Rosso, and soon-to-be-opened Plum) the other night and, after smothering (and possibly scaring) him with my enthusiasm for this product, he told me why it's so hard to find. Apparently, finding good quality goat's milk can be challenging because of its inconsistency. Moreover, goat cream is even more of an obstacle. No kidding. After about 30 minutes of internet searching, I could only find 1 local dairy goat farm (that sells the milk, not a product made with it...and not butter from what I can see), Redwood Hill Farm in Sebastopol. But I found them, so restaurants can too, right? Apparently, even if a restaurant does find something that they can rely upon, there's another big issue: the price. Because labor costs are higher than with milking cows, it takes 10 goats to produce as much milk as 1 cow, and the government doesn't subsidize these farms, the costs involved in making this small brick of ambrosia are quite high. For a restaurant, buying butter at $8 a pound would be a major concern. Best to leave that kinda buying up to crazy consumers, like me, who would start selling off of their worldly possessions for one more lick of that sweet goaty goodness. Man, with comments like that I'm sure I come off as a sane, stable person. I guess one addict's crack is another addict's goat's milk butter. Well, my friends might think I'm weird and abandon me, but at least I'll always have that pound of goat's milk butter in fridge to keep me company. That was maybe the best ode to goat's milk butter ever written. All the goats in the world deeply appreciate. They actually all got together and wrote me a note to let me know that, while the don't have the same kind of strong feelings for me, they were really flattered and thanked me. It was a really thoughtful gesture.